Single Wall Dual Color Hopper is a job of Stainless Steel Fabrication container used to flow a dual color bulk material such as ointment downward and can discharge its contents. A tapering container, working with a hopping motion, through which above material passed into a machine. 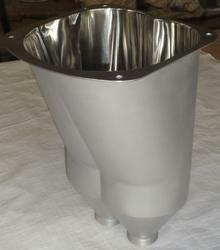 This is a customize job of Stainless Steel fabrication made from a SS sheet. This hopper was generally fitted on top of the machines. Suitable for Pharmaceutical ointment dual color filling purpose. Hopper is made with customize specification and made with 16 swg.316L Stainless Steel. Inner part mirrored finish while outer part is done as per requirement. Upper part of hopper is a broad oval shape, and lower part is made with narrow oval shape. Looking for Single Wall Dual Color Hopper ?